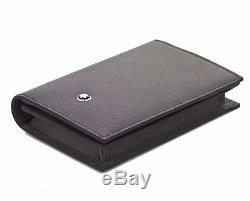 Business card holder with gusset, made European full-grain cowhide with Montblanc brand name, and a Montblanc emblem with palladium-coated ring, with spacious gusset for business cards, 2 pockets for credit cards, 2 additional pockets, back pocket. Internal organization: large compartment for business cards, 2 pockets for credit cards, 2 additional pockets, back pocket. Dimensions: 7 x 10.5 cm. The item "Montblanc Meisterstuck Selection Business Card Holder 109659" is in sale since Friday, March 9, 2018. This item is in the category "Abbigliamento e accessori\Uomo\ accessori\Portadocumenti". The seller is "angiolellaversacigioie" and is located in capo d'orlando, ME. This item can be shipped worldwide.